Electrical conduit is used to run electrical lines underground and to keep the electrical lines protected. Rules on how conduit can be installed and manipulated have been set by utility companies to ensure the integrity of the conduit and to help protect service crews who may be required to work on the conduit in the future. Electrical conduit must meet set criteria in order to be used in commercial applications and be installed in a manner that meets the local utility code. Electrical conduit that is used in commercial applications is required to be UL-approved and rated for 90 degree Celsius cable. The conduit should be gray in color and designed for underground applications. The couplings used with the conduit must be the long line type. Conduit raceways use schedule 40 PVC conduit whether they are the primary or secondary conduit raceways. When constructing a raceway for conduit, the number of bends is limited to three regardless of the degree of the bend. 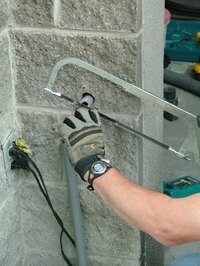 If a bend in the conduit is required it must be done at the shop in a controlled environment to ensure the integrity of the conduit. Field bending is not permitted. Conduit should be laid in straight lines that remain level unless otherwise specified on a construction drawing. The end of a conduit must be sealed completely to prevent the entrance of water or other debris into the conduit. There must be a distance of at least 36 inches from the top of the conduit to the bottom of the final grade of the road. The electrical conduit must have at least 18 inches of space from the outer edge of the conduit to the outer edge of any other conduit or piping that is buried parallel of the electrical conduit. Other utilities that must go across the electrical conduit provide 12 inches of space between the bottom of the utility conduit and the top of the electrical conduit at the point where they cross each other. Raceways of electrical conduits must be clear of obstruction and will be checked by the local utilities. If obstructions are found by the local utility the construction company will be required to resolve the obstruction before the electrical conduit and raceway installation are approved.